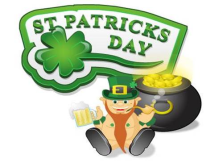 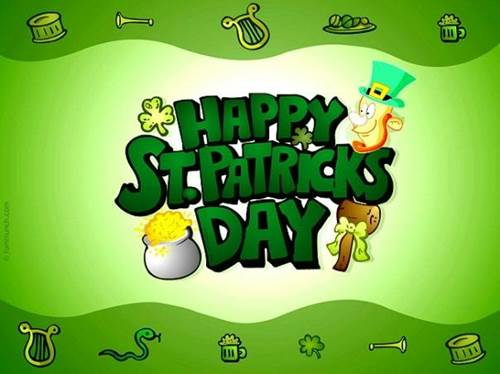 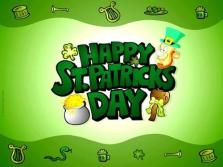 St. Patrick’s Day is celebrated on March,17. 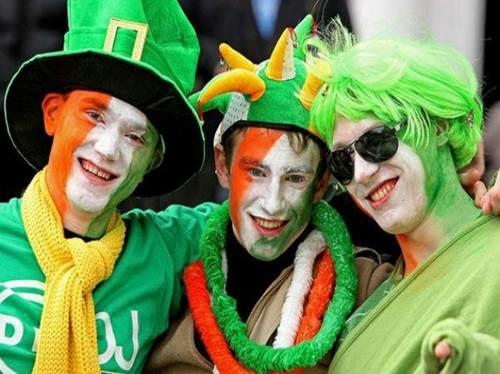 There are a lot of Legends about St. Patrick in Ireland. 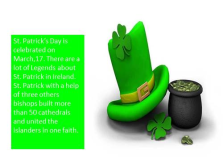 St. Patrick with a help of three others bishops built more than 50 cathedrals and united the islanders in one faith. Of the many legends about St.Patrick, which survive in Ireland, two in particular have been preserved in the Irish folklore. 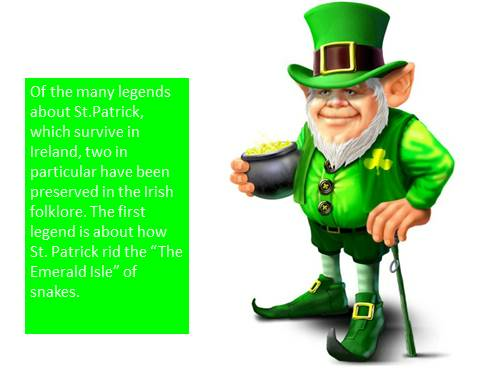 The first legend is about how St. Patrick rid the “The Emerald Isle” of snakes. 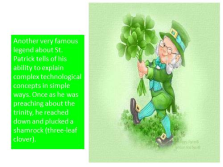 Another very famous legend about St. Patrick tells of his ability to explain complex technological concepts in simple ways. 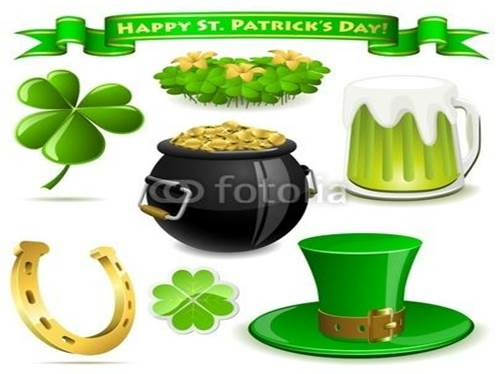 Once as he was preaching about the trinity, he reached down and plucked a shamrock (three-leaf clover). 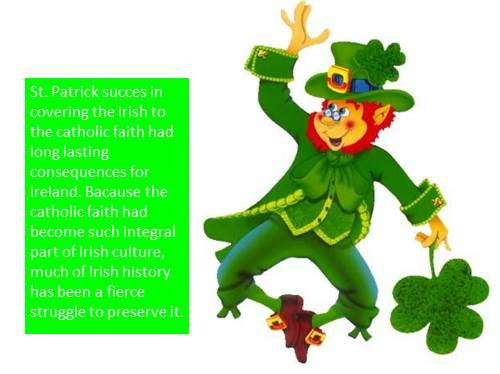 St. Patrick succes in covering the Irish to the catholic faith had long lasting consequences for Ireland. Bacause the catholic faith had become such integral part of Irish culture, much of Irish history has been a fierce struggle to preserve it. The symbols of his holidays are the shamrock, the leprechaun, the rainbow. 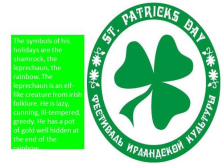 The leprechaun is an elf-like creature from Irish folklore. He is lazy, cunning, ill-tempered, greedy. 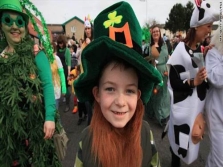 He has a pot of gold well hidden at the end of the rainbow. 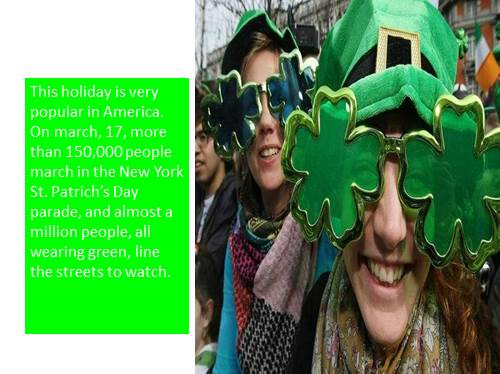 This holiday is very popular in America. 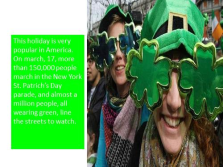 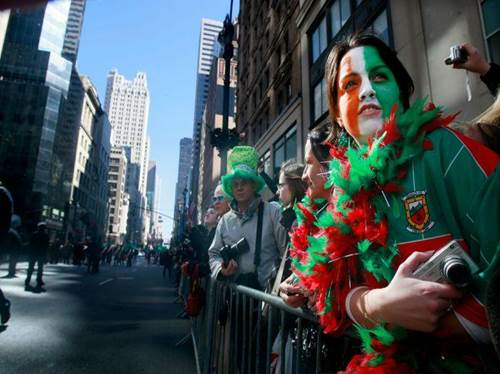 On march, 17, more than 150,000 people march in the New York St. Patrich’s Day parade, and almost a million people, all wearing green, line the streets to watch. 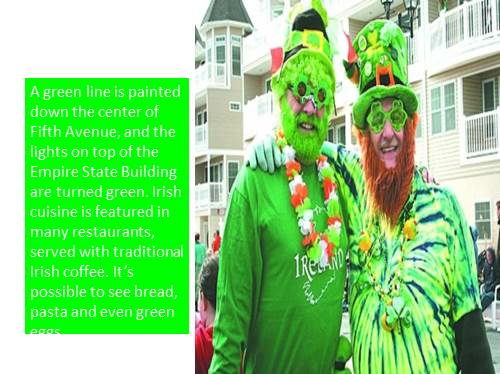 A green line is painted down the center of Fifth Avenue, and the lights on top of the Empire State Building are turned green. 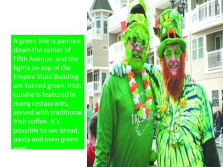 Irish cuisine is featured in many restaurants, served with traditional Irish coffee. It’s possible to see bread, pasta and even green eggs.